Last Wednesday, 6 September, the Luciano Pavarotti 10th Anniversary Concert, celebrating the life and work of the great Italian tenor, took place at the Verona Arena in Italy. The concert, attended by a crowd of more than 15,000, was broadcast internationally and played host to performances from a host of top musicians. Placido Domingo and Jose Carreras, who together with Pavarotti himself were known as The Three Tenors, both performed, as did Andrea Bocelli, Francesco Meli, Vittorio Grigolo, and others. Also among the performers was the soprano Angela Gheorghiu, who performed not only with Carreras and Domingo, but also with Il Volo, a trio of young Italian tenors, in a performance of a new arrangement of Agustín Lara’s song Granada, the music for which was prepared in Dorico. 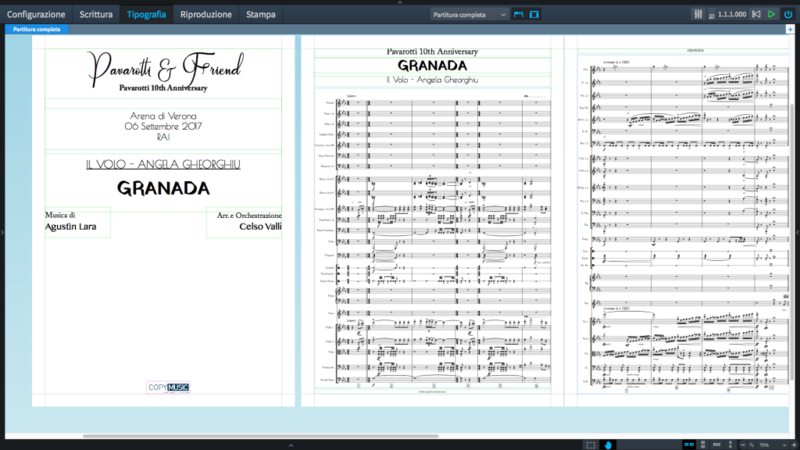 The piece was orchestrated by Celso Valli, and the score and parts were prepared by Patrizio Cara of Copy Music sas, one of Italy’s top music preparation experts. This was the first major project undertaken by Patrizio in Dorico, and will no doubt be the first of many more to come. Dorico is already being used by thousands of music professionals like Patrizio around the world. If you’re not yet one of them, consider downloading a free 30-day trial to experience for yourself the future of scoring.